Day one is done and dusted. I had planned on staying at Muttonbird Hut but after arriving just after 2:00pm I decided to press on to do Torbay inlet. Low tide was at 5:30pm and I thought this was going to be my best opportunity to cross. This was a good decision and after working out the best area to cross and stripping down I headed over in water less than knee deep. Had I done this crossing this morning, I would have had an extra 40cm of water. 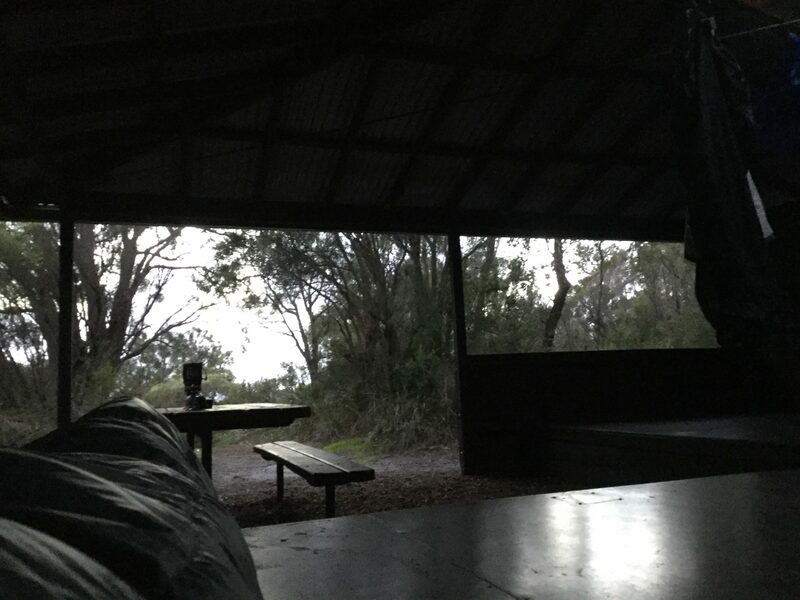 I pressed on to Torbay Hut which meant around 45 minutes of night hiking. I know it’s only day one but I found it to be a good trail so far and as a result I averaged 4.5km an hour for just over 33km for the day. I haven’t seen anyone else as yet and given the weather I’m not surprised. Yesterday, just after I hit the board walk section at the Albany wind farm, the forecast wind gusts of 100km hit. I had to hold on to the railing otherwise I would have been blown over. I’m just about to get up, have breakfast, pack and head off for the day and as I’m inland for most of the day, I’m a bit more sheltered.